Cupcakes make me happy. They're sweet and soft and come in so many flavors. Making them is a stress reliever for me, it can take everything off of my mind. I'm so excited to start making some holiday varieties! This will definitely not be helping my workout, but really I prefer baking to eat a lot of them. 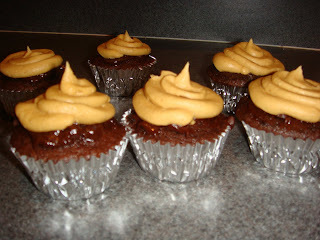 These are Peanut Butter and Chocolate Ganache cupcakes that I made last saturday. I adapted it from it from Beantown Baker. You can use whatever chocolate cake recipe that you like, or a box mix. Mix confectioner's sugar, peanut butter, butter,vanilla and salt in bowl with electric mixer on medium until creamy. Add cream and beat on high until smooth. Bake cupcakes and cool. Cut out cone shape in the center and chop reeses cups. Put them in the cut out spaces. Put a little ganache on top and then put top back on (I cut off the pointy part of the top piece and just ued a flat top). 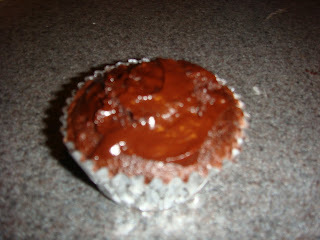 Spread a little more ganache on top and let cool. 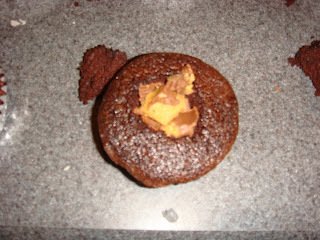 Then put your icing in a piping bag, snip the corner off and pipe on top. Yum! 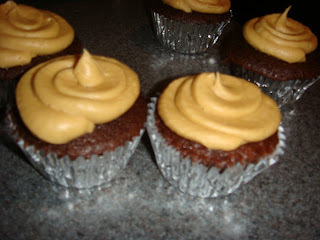 These look great Jen!